Hang on, how many chips did you say I had ?? 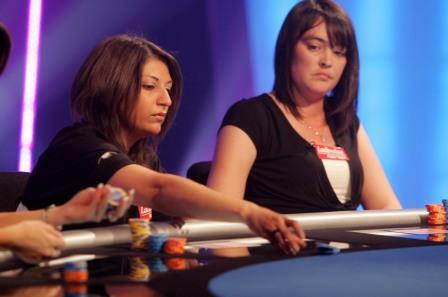 Women and poker – some male poker players think it’s an easy ride when there is a woman at the same table. 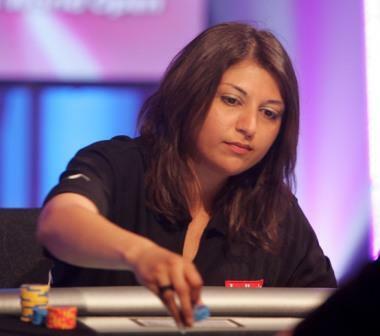 After watching the Party Poker Women’s World Open they may change their minds. 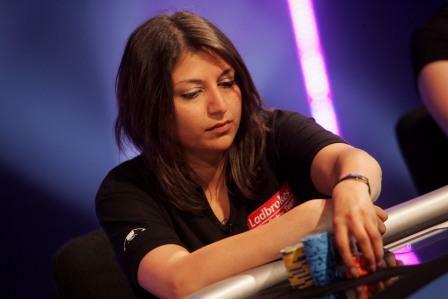 I played my PartyPoker.Net World Women’s Open heat last week. Having had a good run recently, I was feeling confident. I got to the studio earlier then scheduled and found Norman Pace watching his wife Beverley on the screen in the green room. She was playing in heat 2. With a prize pot of $108,000, this tournament had attracted some big names, like Jennifer Tilly, Shannon Elizabeth, UK’s Lucy Rokach, Katherine Hartree to name but a few. Also a great player, my friend, Shelley Rubenstein had played the day before in heat one but had lost out to another friend and Sky Open presenter Kara Scott, who had done a double by winning the celebrity heat the same morning. As I sat down to watch, two out of the six had already been knocked out. Sitting in the green room waiting for my “turn” it was quite relaxing listening to Jesse’s commentary and his infectious laugh. Shannon Elizabeth was his partner in the commentary box this time and it was good to hear a female’s point of view with regards to the play. Karen McCaul, girlfriend of Marty Smyth the Irish Open Champion, got heads-up with Beverley Pace after the elimination of Lois Clear, Patricia Li, Karen Frank and Lucy Rokach. 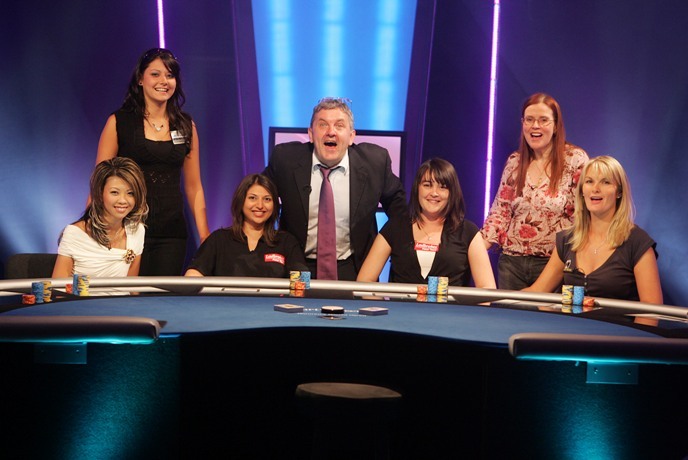 Beverley was victorious and became the second contender to the final table. With my heat ready to start, I got the usual good luck kisses from everyone, including Raj, my husband, who was there to support me, before I went into the baking studio. The air-con had been turned on for a while, but it hadn’t really made much of a difference. Liz Lieu, Jackie Vaswani (wife of Mobster Ram), Michelle Bricknell (a very well known and respected player on the circuit), Claire (daughter of Anthony Hardy or Bookie as he is known and the recent winner of the Party Poker World Open III) and last year’s Party Poker World Open winner, Pippa Flanders, all made their way to the studio with me. These were my opponents. Play started and within the first couple of rounds, Liz Lieu was down to about 25K from the 100k we had all started with. The structure of these TV tournaments is very tough, and there are only 50 big blinds, so once entered into a pot it needs to be won. Liz went out 1st going all-in with pocket 2s. After putting up a huge fight and being totally card dead, I went out in 3rd place, leaving Michelle Bricknell and Jackie Vaswani to do heads up battle. Jackie went through to the final table. Whoever said that women don’t bluff and only bet when they hit don’t know what they are talking about. These women can definitely play and this will be witnessed when the event is televised in November this year on Channel 5. I have just managed to put together some furniture, FINALLY, to stock all my ever growing craft supplies. I swear I could set up a shop in that room, LOL. But, then again, I expect we crafters all feel like that, but I am serious, I really could LOL. I recently got together with Sarah and Vicky from Stamp Addicts and they have asked me to teach a workshop at their place, end of October. I will be making exploding boxes, which have become so popular recently. They are fantastic because you can raid the scraps box and use up all the little favourites that you just couldn’t throw away. These boxes can be used in place of a greeting card for a special person or if using photographs they are great little keepsakes of a special memory for the scrapbookers amongst us. I have made both types and let me tell you, they are so well received. I think they will be putting pictures of the samples I made on their website soon. Think that’s about it for now. Hope you’re enjoying reading these blogs. I will try to put up some pictures of recent projects soon, I promise. I think I better get back to my craft room and try to sort stuff out. I am planning on drinking loads of coffee and staying up all night until it’s done, I’ll let you know if that is in fact what happened or if my husband woke up at 5am and found me asleep in amongst all the papers LOL. Gala is the place to go – for me !! I had always traveled to Birmingham or Luton to play a live game of poker, so recently I thought I’d give the local casino in Northampton ago and see what was happening. Upon deciding that I wanted to play more live poker, it was great to find a good structure at the Gala. The £50 freeze out and the £30 double chance are fantastic. Start with 4000 chips (2000 with the double chance but you can get all your chips (4000) to start with if you prefer) with half hour blinds. The blinds go up more then expected but the game is finished within 4 to 4½ hours. It doesn’t turn into a crap shoot so it’s a fantastic way to practice for bigger events. On my very first visit I ended up heads up and we decided to chop it. I walked away with £585 for a £50 buy in. Result!